"X" marks the spot for reliable self defense. Super-X® has a well-earned reputation for hard-hitting performance and rock-solid reliability. It's as close to a full-bore 10mm factory load as it gets, exploiting the round's full potential. The Silvertip® hollow point projectile delivers maximum penetration and rapid energy transfer with virtually no weight loss. Notched for controlled expansion. Flawless function in the Glock 20 and Kimber 10mm. Order your Winchester® personal protection ammo right here! 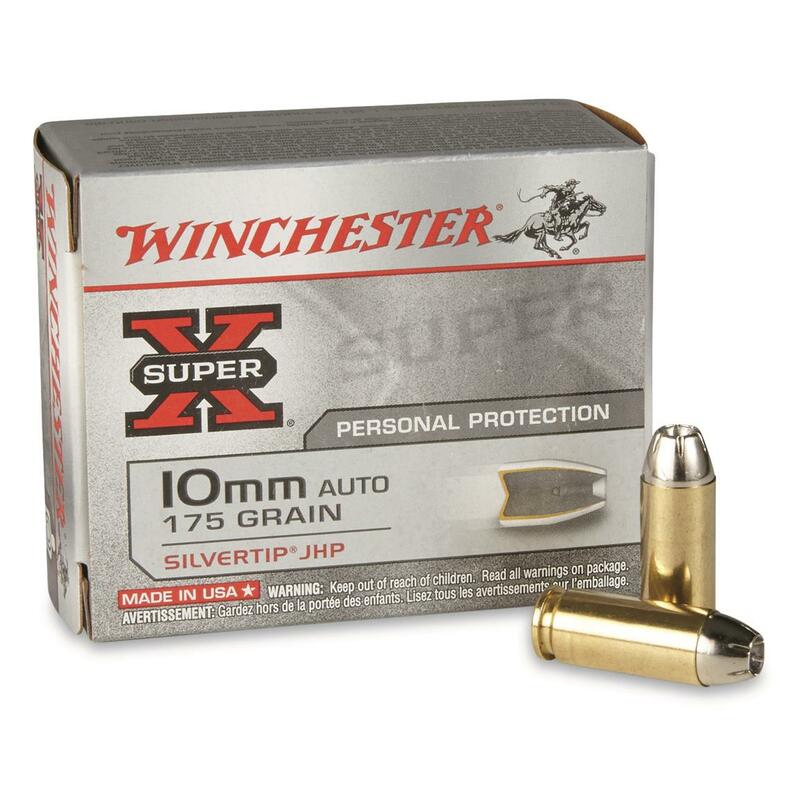 Winchester Super-X, 10mm, 175 Grain, STHP, 20 Rounds is rated 5.0 out of 5 by 14. Rated 5 out of 5 by dweberlvnworth from Powerful, reliable, and accurate I love 10mm. Having said that, quality ammo can be challenging to find. I ordered 10 boxes of this stuff, and only received one box, and the rest is on back order. I have used it before in my Sig P220 Legion 10mm pistol and my Glock 29. It is not watered down 40 cal, but robust 10 mm ammo. Rated 5 out of 5 by Jason C from Great Carry Load for the 10mm The 10mm Silvertip is still my go to carry load for my Glock 20 and Glock 29. Lots of new 10mm loads out now, but this one still has the best balance of bullet weight and velocity with a proven projectile that will expand. Out of my factory guns velocity thru my chronograph is right at 1200 fps. This is not a watered down 40 S&W level load. Accuracy is very good and recoil is not abusive. Rated 5 out of 5 by MORiver from Shoots well! I own a S&W 686 that is scoped. I have sighted this rig in hoping to take a whitetail with it this fall. I am sighted in at 50 yards and couldn't be happier with the group it has printed. Rated 5 out of 5 by Steve from great price/ great product use these for my defence round but shot a couple boxes to get the feel. these are true 10mm rounds and hit hard none of that low recoil stuff. Love them will order a ton more. Rated 5 out of 5 by randyG from great ammo It's the only 10mm 175 grain ammo that comes close to the original 10mm loads. Everyone has 10mm loaded down to 40 short and wimpy levels or have bullet weights under 150 grains. 10mm used to be loaded to magnum speeds with 200+ grain bullets. Rated 5 out of 5 by kelm from Best ammo for my Colt Delta Elite. Accurate and hard hitting. No feed or ejection malfunctions. Rated 5 out of 5 by Mike from Great ammo Very good price with great service.